Water Features. A Relaxing Splash to your Landscape. Nothing can give your garden a peaceful, soothing atmosphere more than water features. Be it ponds, waterfalls, or anything aqua-related, they’re sure to create a fun but relaxing splash to your landscape. This particular water feature never fails to add a touch of elegance, romance, and serenity to gardens. In most landscaping plans, you’ll find water fountains located at the center or any other prominent area. This is ideal if you want to make the most out of their beauty and they’re certainly worth drawing attention to. Some water fountains are DIY models but they tend to be smaller and have far simpler effects. Greater height for water fountains naturally creates more special effects, but they’re sure to cost more and may require professional installation. Although they’re in no means less spectacular than water fountains, waterfalls are often located at the side or corner of a garden. This, however, is entirely due to practical reasons: waterfalls, unlike fountains, require walls as a foundation before they can operate. Artful piles of rocks are commonly used as a foundation for waterfalls because they add to the natural look. It’s your choice, however, as to whether you’d use faux or natural rocks for your waterfalls. Either would do. These are essential if you’ve either a water fountain or waterfalls in your garden. After all, where else would water from fountains or waterfalls pool but in such ponds? In creating garden ponds, the first thing you’ll have to decide on is whether to have them above or below ground level. Garden ponds with underground depths are more natural but could be more expensive and difficult to accomplish. They look exceptionally well, however, when used with waterfalls and especially when you’ve fish and other marine species inhabiting your garden. If there are no aquatic animals in your garden, you need not make your underground pond too deep. It could be no higher than a few inches and will still look beautiful, depending on how everything works together. The base of your pond need not be flat and even. You could, for instance, follow the naturally descending outline of your garden and create descending layers or levels for your garden pond. Above ground garden ponds will, on the other hand, require you to build an external structure and you’ll have to make sure they fit well with your overall landscaping theme. In most cases, people prefer to build walls wide enough for people to sit on and maybe get their feet wet. When choosing animals and plants to add to your garden, the first thing you should focus on is their color and whether they’ll complement the rest of your garden or not. 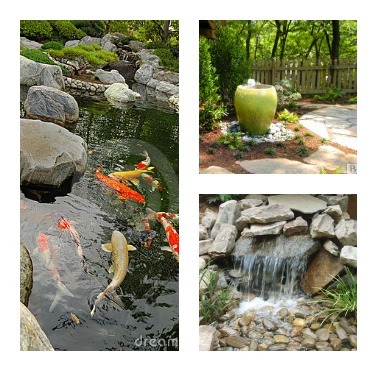 Goldfish and koi are perennial favorites for water gardens because of their bright colors. Lilies are also commonly preferred because they float on water, seaweeds for their eye-catching height, appearance, and shape, not to mention the fact that they’re edible as well. Other edible aquatic plants include wild rice, water fern, lotus, duck potato, and chameleon. All in all, remember that even the smallest part of your landscaping plans can affect the overall result so be sure that everything complements each other to maintain the picturesque look of your garden.